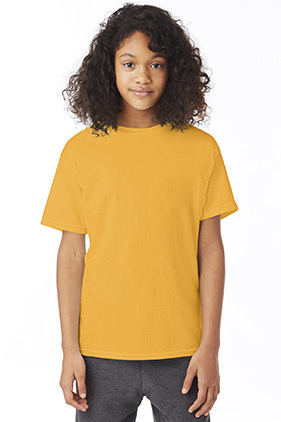 Pre-shrunk 50% cotton/50% polyester 5.2 ounce youth t-shirt. Made with up to 5% polyester from recycled plastic. Double-needle cover-seamed neck with lay flat collar. Shoulder-to-shoulder tape. Double-needle stitched sleeve and bottom hem. CPSIA tracking label compliant. Tag free neck label.